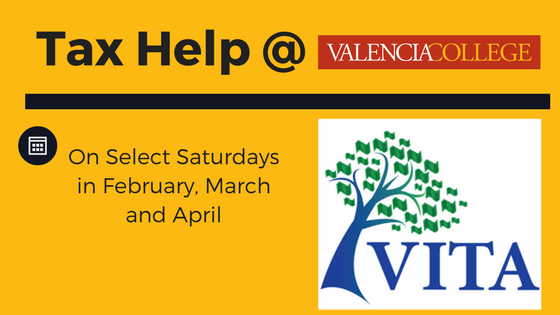 Orlando, FL –Valencia College accounting students and professors will be offering free tax help to the public on Saturdays during February, March and April. The tax help, offered at four Valencia campuses in Orange and Osceola Counties is free and open to the public. Preference will be given to senior citizens, the disabled and low-income individuals. 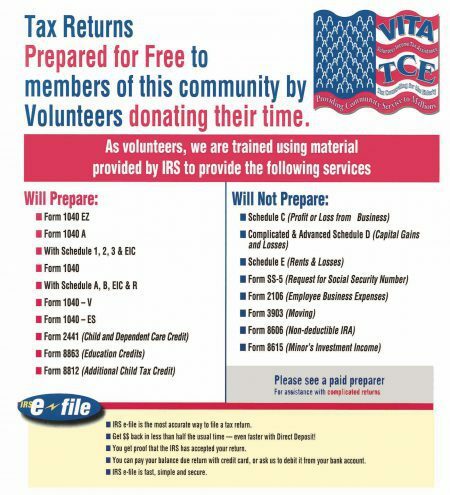 The volunteer tax preparers will be e-filing electronic returns for free. At East Campus, the tax sessions will be held on selected Saturdays from 10 a.m. to 3 p.m. in Building 7, rooms 113 and 117. The sessions will be held on Feb. 3, Feb. 17, March 10, April 7 and April 17. The East Campus is located at 701. N. Econlockhatchee Trail, Orlando. The Winter Park Campus, located at 850 W. Morse Blvd, will host a session on March 24, from 10 a.m. to 3 p.m. in Building 1, Rooms 105 and 115. For more information about the East and Winter Park Campus tax preparation sessions, call 407-582-2849. At the Osceola Campus in Kissimmee, the tax sessions will be held on selected Saturdays from 10 a.m. to 3 p.m. in building 3, room 100. The sessions will be held on Feb. 10, Feb. 24, March 3, March 24, April 7 and April 14. The Osceola Campus is located at 1800 Denn John Lane, Kissimmee. The Lake Nona Campus, 12350 Narcoossee Road, Orlando, will host a session in the main building on March 24, from 10 a.m. to 3 p.m. For more information about the tax preparation sessions at Osceola and Lake Nona campuses, call 321-682-4224. Please see the flier below for a list of the tax forms that volunteers will prepare.